A new record was set earlier this month when one of Australia’s oldest surviving coins, the famous Holey Dollar, was sold at a Melbourne auction house to a private collector for a staggering AUS$495,000, beating the previous record of AUS$485,000 set in 2011. The fascinating 200 year-old history behind the Holey Dollar – so-called because of the distinctive hole in its centre – has captured the imagination of collectors not just in Australia but worldwide. In 1813, to combat a local currency shortage, the Governor of New South Wales, Lachlan Macquarie came up with a cunning plan. Enlisting the services of a convicted forger William Henshall, Macquarie ordered the middle of 40,000 coins to be punched out and inscribed with a crown – this became known as the ‘Dump’. 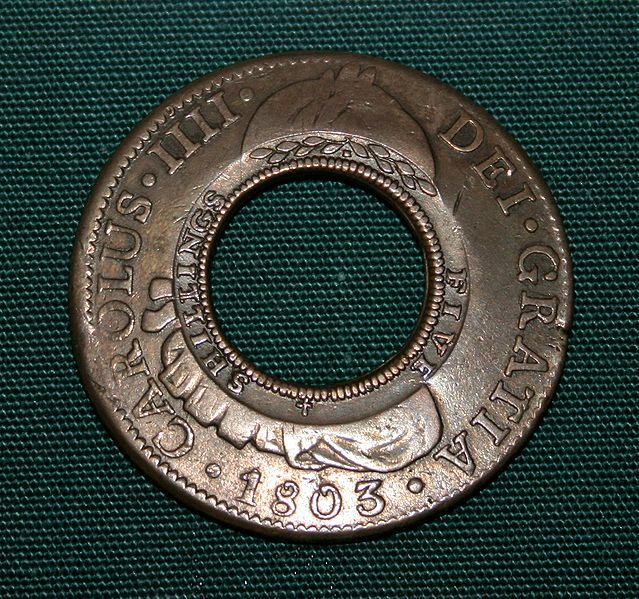 He then stamped the outer ring – the ‘Holey Dollar’ – with the words ‘New South Wales’ and the year of issue. The point being that the two pieces had a higher collective value and so were worth more if they stayed as one whole coin in Australia than individually overseas. Problem solved. The coin sold at auction in Melbourne had been minted in 1813 from a Spanish Silver Dollar that had been struck at the Lima Mint in 1805. Out of a very limited number known to have survived, the one sold recently is thought to be among the finest examples. The Holey Dollar and Dump was withdrawn from circulation in 1829 and most were shipped to London to be melted down or sold off as bullion silver. Of those that survived, there are now only some 300 left, of which 200 are in private hands. They are among Australia’s rarest legal tender coins and on the rare occasion they come up for auction, they attract considerable interest. The question now is how long before this new record is broken?